Frugal mojo… Did you lose your’s over the holidays? Can I see a show of hands? If you could see me, you’d see I’ve got both hands in the air. Plus spirit fingers! My frugal mojo is currently contemplating holidaying permanently with the dodo. I need to recall it from the edges of extinction. NOW. I’d like to blame this loss of frugal mojo on the holiday season but in truth, the holiday season is not a big money sucker for me. Not because I’m an Ebeneezer Scrooge in drag – that’d be one heck of a sight – but because there are only three of us at the table on Christmas day; my mum, my daughter and myself. The biggest splurge for the day is a Lion’s Club Christmas cake which is the best rich fruit cake you’ll ever eat. Ever. And, I don’t really like fruit cake! Why have I lost my frugal mojo? The single biggest reason my frugal mojo is gone is because I stopped tracking my income and spending on a cash flow spreadsheet. A fatal oversight when your income is both intermittent and erratic. I think it was Tim Ferriss (author of The 4 Hour Work Week & The 4 Hour Body) who said, what you track you can control. I stopped tracking and lost control. With my income taking a stupendous dive due to the most profitable platform for my online business becoming the least profitable platform, to the point where it’s debatable whether or not it’s even breaking even anymore; my income and expenditure should have been the most important thing to track. Instead, I engaged in the age old, pretend it’s not happening approach. If you’re wondering how that approach worked out? The answer’s a no-brainer; BADLY. For the first time in over 20 years, I’m carrying a balance on my credit card. And that balance is creeping up. Actually, creeping up is probably the wrong description, shooting up is closer to the truth. Now the challenge to get the balance sheet back in the black begins. Step 1, Track Everything. E V E R Y T H I N G.
I’ve resurrected my cash flow spreadsheet. It’s just a simple Microsoft Excel spreadsheet. Nothing fancy. Just simple columns and rows. A column for each month (but, I’ll update the figures weekly) and rows for each income source and expense. And, a total at the bottom that updates automatically as you enter new information (highlight each field in use in a column, plus an extra one at the bottom and click AutoSum). At the end of the month, transfer the positive (or negative) amount to the top of the next month’s column. And, repeat. You’ll soon see if you’re getting out of, or deeper into debt. If your carried forward amount is negative, you need to make adjustments to your spending. Now. Always remember the Law of Holes. Using a cash flow spreadsheet is a great way to keep an overview of how many dollars are coming in and how many are going out. I usually just track month by month but this time, I’ll track weekly. Tracking the numbers weekly means I can correct overspending on any category quickly and before it begins to compound. Plus, because interest is being calculated daily on that credit card balance, I’ll be making payments as soon as money comes in (which can be daily) in an effort to reduce the interest I have to pay. Step 2, Focus on being productive instead of busy. I’m definitely busy. Each day flies by so quickly, I find dinner time has rolled around and I haven’t given any thought to what’s on the menu. Not planning, even in the most casual way, means we often fall back on convenience food which is expensive and generally, unhealthy. Food planning and preparation is definitely back on the agenda. In order to achieve what I want to for my business, I need to get a lot more done in the day. That can be a bit of a catch 22 though. I can’t completely avoid certain black holes for time, such as Facebook or Youtube because I need to use social media for my business. Plus, because my income has taken a massive hit, I need to apply time to solve problems rather than dollars. That means using time as efficiently as possible. I also need to use my time efficiently so I can add another side hustle – I’m exploring a couple of ideas at the moment but putting those ideas into action requires time. I need to free some up without sacrificing sleep (I usually only manage 6 -7 hours as it is). Last week I wrote about creating a debt relief plan. I’m walking my talk and have set some goals for reducing my debt. Luckily, my only debt, other than my mortgage is one credit card. Interest on that card last month was $203.47. There are so many other things I could have done with that money. Including going to the movies at least 16 times or buying a new pair of Dr. Martens. Or… using it to pay down my mortgage. Instead, it went to the bank. That. Stops. Right. Now. If you’re like me and your frugal mojo is a little faded and jaded, take heart! Nothing in this world is perfect, including us. Take some time to acknowledge your situation, re-read Your Debt Relief Plan and then take the first step back to being in control of, or at least fully aware of your finances. It’s never too late to get back on track. 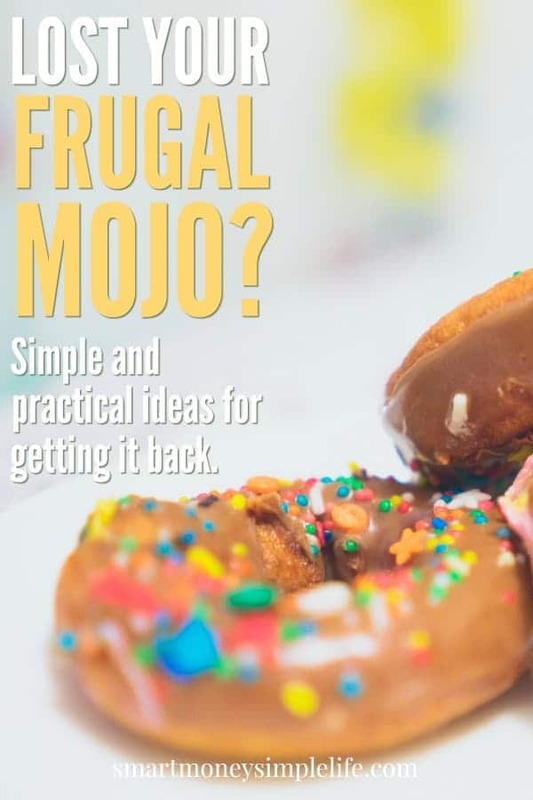 Have you ever lost your frugal mojo? What did you do to get it back? I’ve been a little more lax than I should have as well lately. I stopped meal planning (our biggest flexible expense) and noticed our grocery budget increasing by quite a bit because of it. We’ve also been increasing out discretionary funds more than I like so I’m working on tightening the reigns on both of those to get us back on track once again! Good luck! Glad I’m not the only one! It’s amazing how quickly you lose track when you stop being mindful of each expenditure. Good luck with getting back on track! Great blog.Every once a while I loose it also, because life is tempting, but I always manage to bring it back. Hope you are going also. that cost of groceries are most significant aspect because we shop them every weak. Everything is cheap and very often don’t even look at price, and coupons are almost everywhere just think about them before shopping. Thanks Eva! Now that I’m tracking everything again, it shouldn’t be too long before my finances are healthy. Sorry to hear things have been going south. Everyone loses his/her mojo at some point. I’m bipolar, so in the past I’ve had slight manic episodes that have led to increased spending. And downswings that made me unable to even log on to check accounts. Luckily, the majority of the time I’m in the middle. I love the point about being productive instead of busy. It’s too easy to be doing something at any moment (heellllooo social media!) without getting anything done. Ha ha ha… social media kills me! I need to figure out a way to do it WITHOUT tumbling down the rabbit hole every, single time. The thing to remember is that it’s impossible to navigate in a straight line. The trick is to make course corrections quickly. My holiday from accountability is definitely over!!! Nice work Diane, as I noticed you are very stubborn person and if you put focus on some issues, you make them happen. I wish that I am half that stubborn. thanks for sharing. I hope everything’s going well, Diane! Have a great weekend! Planning (and keeping track) is key!